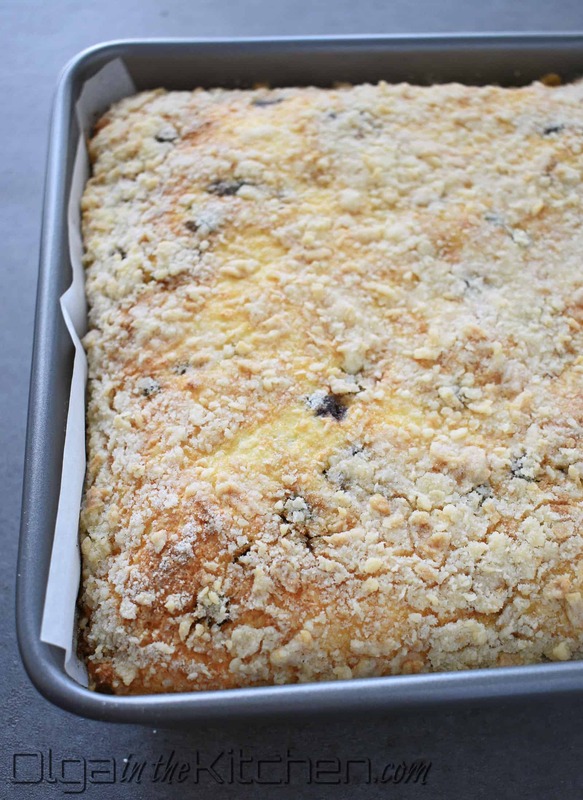 Farmer’s Cheese Blueberry Crumb Cake: slightly sweet, creamy and buttery with a little blueberry hint. 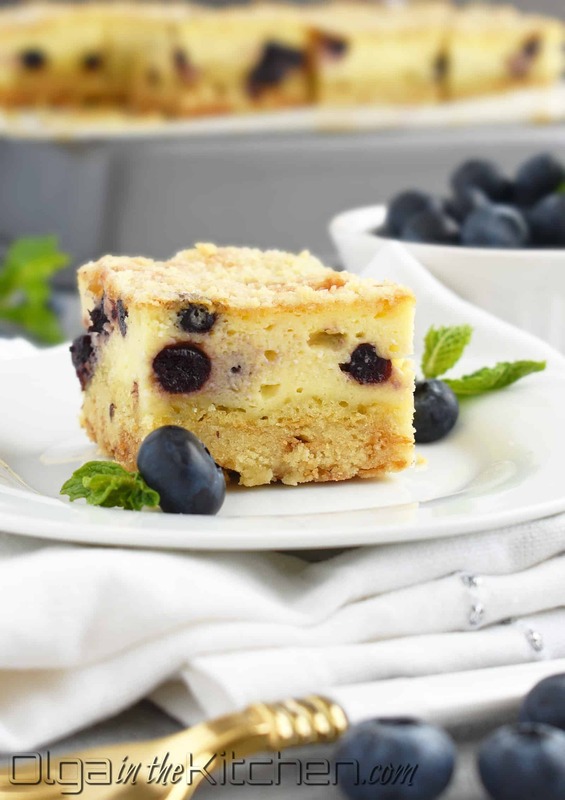 This cake reminds me a lot of a cheesecake when you bite into a cold, refrigerated piece. 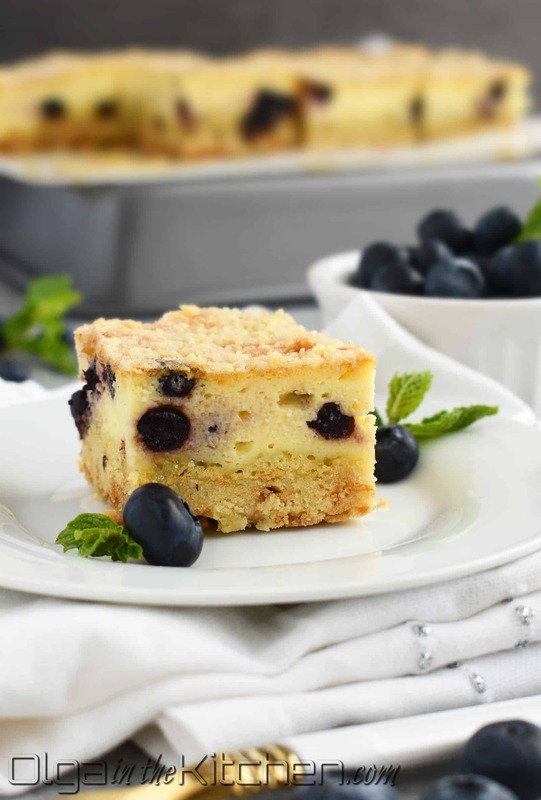 We might as well call it ‘Ukrainian Cheesecake’! It all starts with a buttery crust created from the flour-butter mixture, topped with homemade farmer’s cheese and finished with more buttery crust that creates slightly crispy finishing that we like to call topping. Farmer’s cheese is very popular among Ukrainian people. There’s a good percentage of desserts we make include homemade farmer’s cheese. I myself am a huge fan of it. 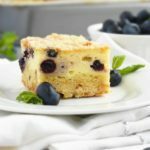 It’s easy to work with; it’s creamy, delicious and tastes nothing like store-bought cottage cheese. It is just simply better. You can find a recipe of Farmer’s Cheese at this link. 1. 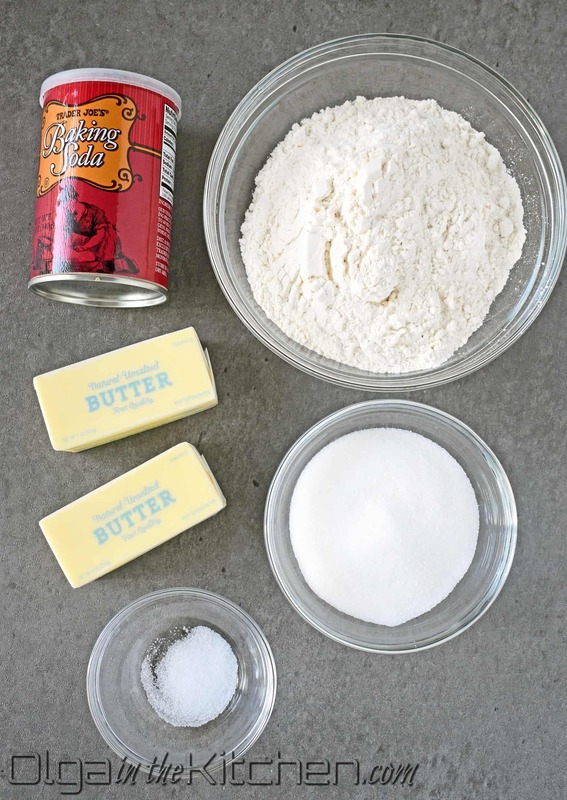 In a medium bowl, sift, combine and whisk: 2 cups all-purpose flour, 1/2 cup granulated sugar, 1 tsp baking soda and 1/4 tsp table salt. Grate 6 oz cold butter onto a big hole into the bowl with dry ingredients and mix with a fork to resemble coarse meal. This would be your crust and topping. Cover with plastic food wrap and refrigerate for 1 hour. 2. With your hand, crumble 4 cups farmer’s cheese into a measuring cup and add to a separate medium bowl. Break cheese a bit using a fork. 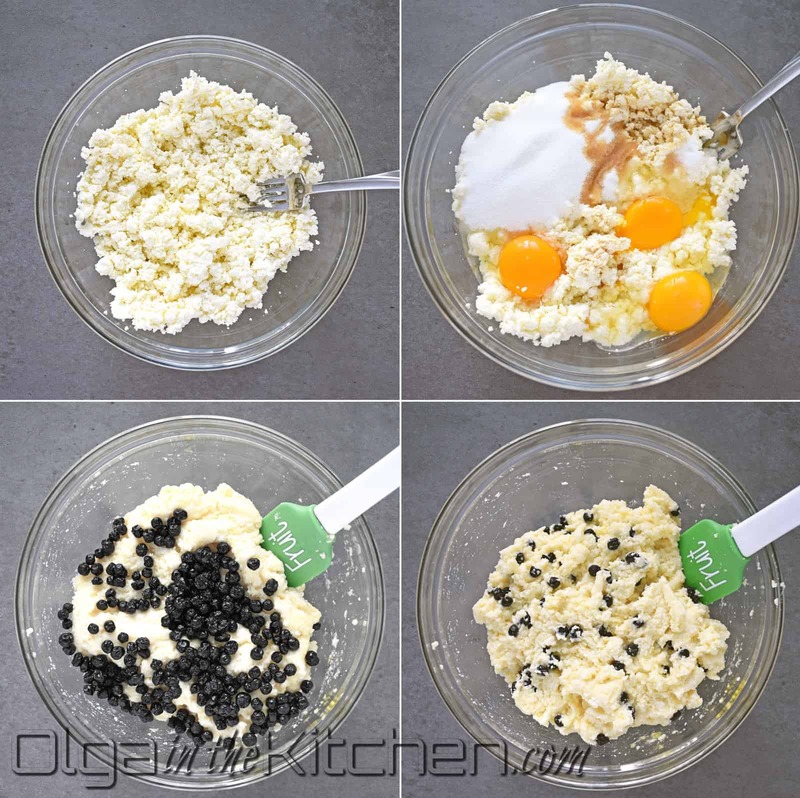 Add 3 eggs, 1/2 cup sugar, 1 tsp vanilla extract and 1/4 tsp salt to the bowl with cheese and stir everything together until combined, using a rubber spatula. Stir in 3/4 cup dried blueberries. Set aside. 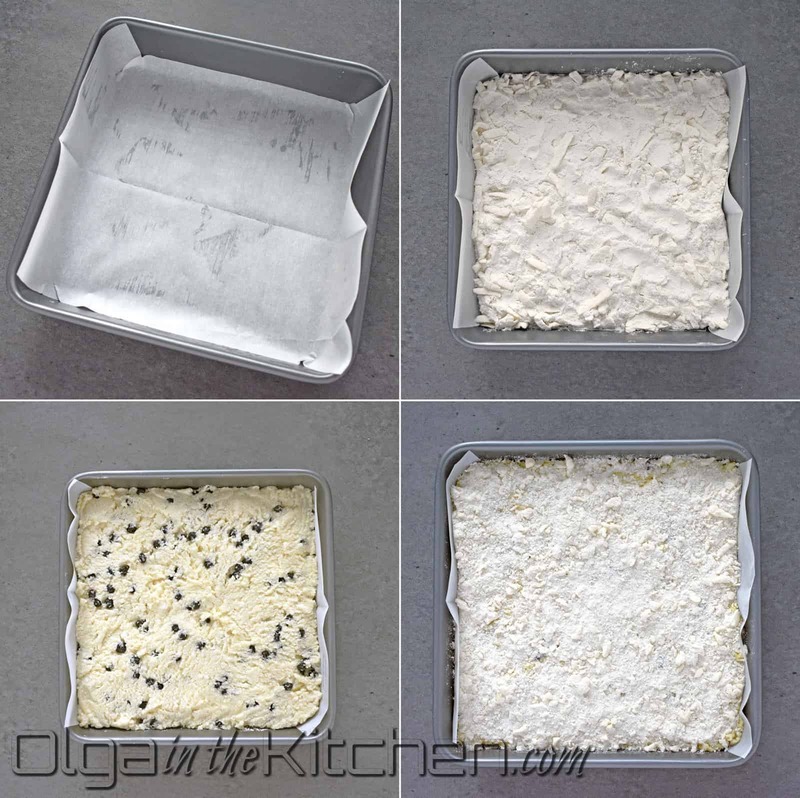 Butter a 9” square baking pan. Line the baking dish with parchment paper. 3. After an hour, preheat the oven to a 350°F and remove the crust from the refrigerator. Spread most of the crust mixture into the baking pan, leaving about 1/2 cup for the topping. 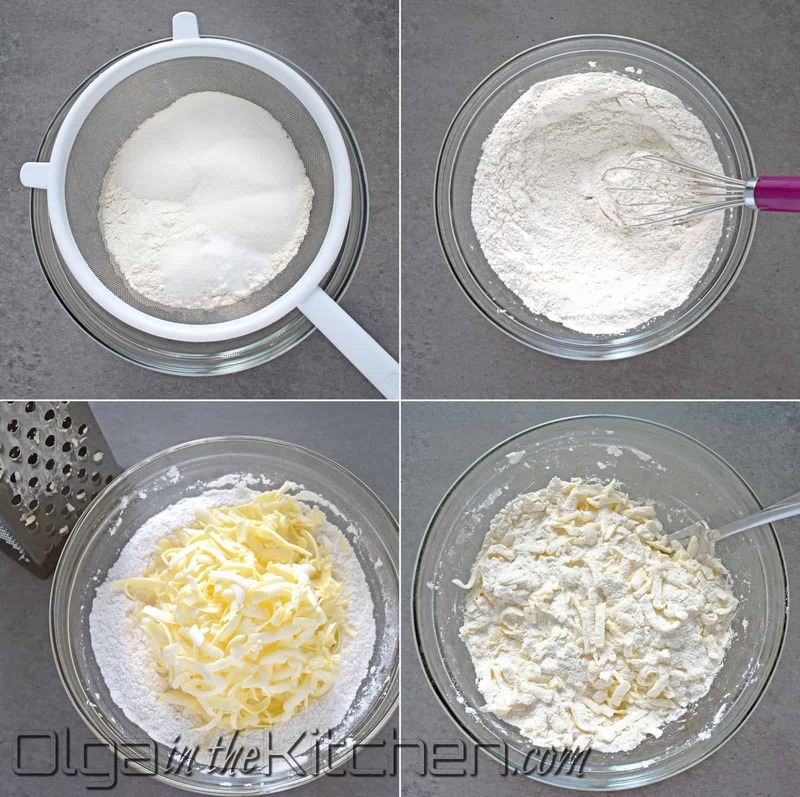 Spread all of the cheese filling evenly over the crust mixture covering all the edges and corners. 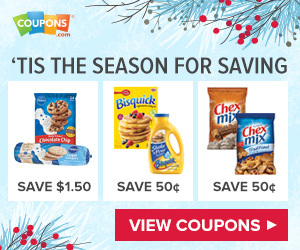 (*Drop bits with spatula here and there and then gently press to spread). Sprinkle remaining crust mixture over the cheese. Bake for 50 minutes. The cake will be fluffy once finished baking and then will flatten once cooled and set (that’s the way farmer’s cheese works). 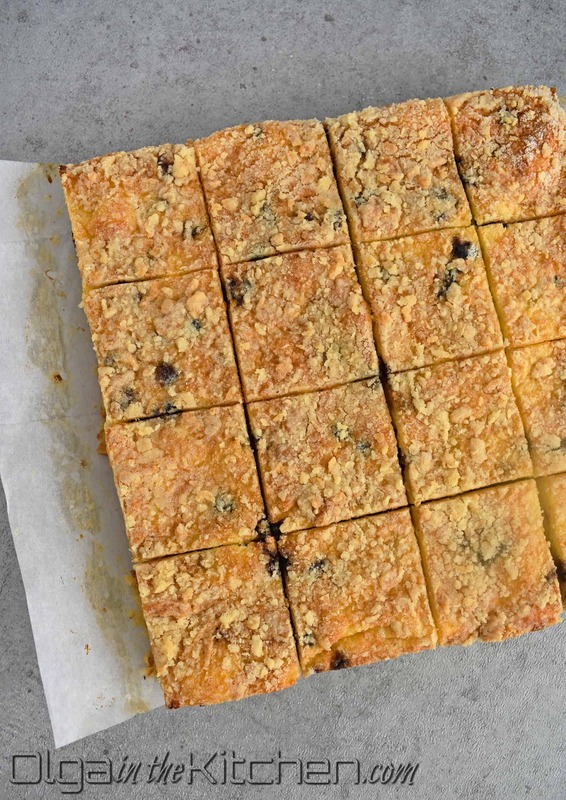 Cool, cut into squares and serve. 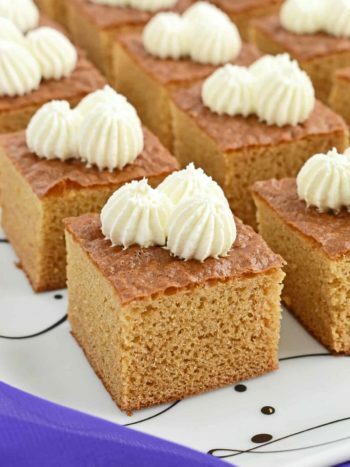 This cake tastes like cheesecake once cooled in refrigerator. Good for 3-4 days in refrigerator. 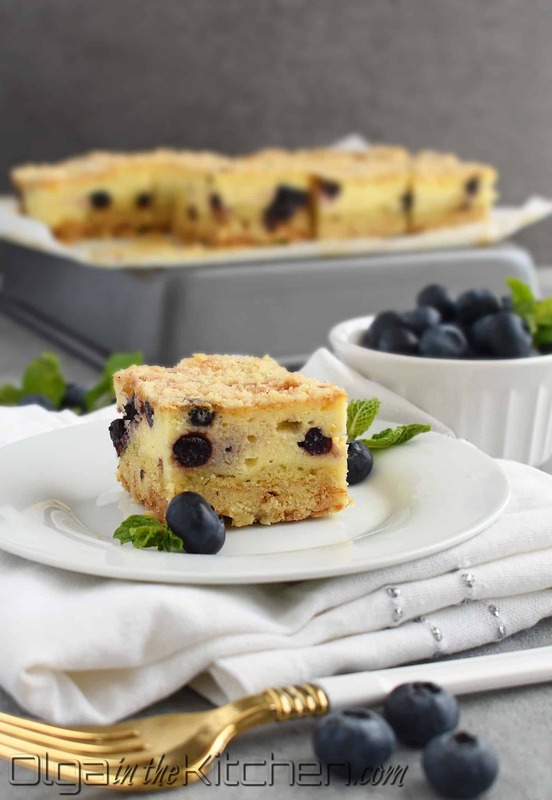 Farmer’s Cheese Blueberry Crumb Cake: slightly sweet, creamy and buttery with a little blueberry hint; Ukrainian kind of cheesecake! In a medium bowl, sift, combine and whisk: 2 cups all-purpose flour, 1/2 cup granulated sugar, 1 tsp baking soda and 1/4 tsp table salt. 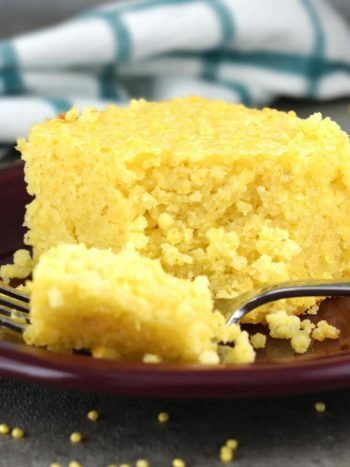 Grate 6 oz cold butter onto a big hole into the bowl with dry ingredients and mix with a fork to resemble coarse meal. This would be your crust and topping. Cover with plastic food wrap and refrigerate for 1 hour. 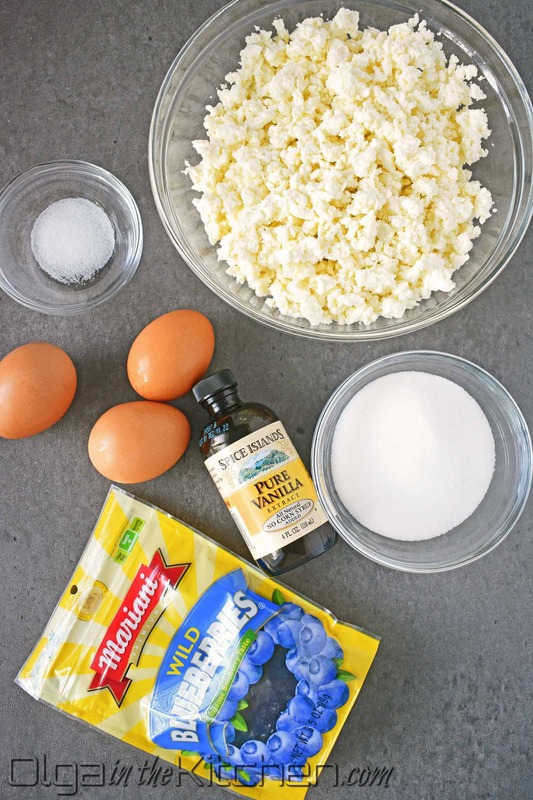 With your hand, crumble 4 cups farmer’s cheese into a measuring cup and add to a separate medium bowl. Break cheese a bit using a fork. 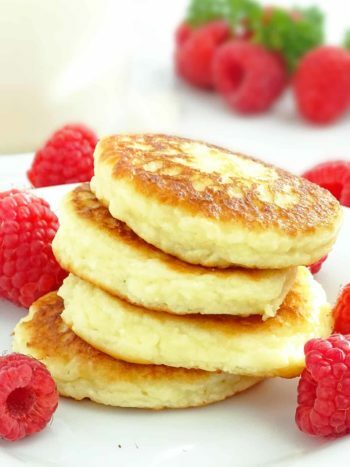 Add 3 eggs, 1/2 cup sugar, 1 tsp vanilla extract and 1/4 tsp salt to the bowl with cheese and stir everything together until combined, using a rubber spatula. Stir in 3/4 cup dried blueberries. Set aside. Butter a 9” square baking pan. Line the baking dish with parchment paper. After an hour, preheat the oven to a 350°F and remove the crust from the refrigerator. Spread most of the crust mixture into the baking sheet, leaving about 1/2 cup for the topping. Spread all of the cheese filling evenly over the crust mixture covering all the edges and corners. (Drop bits with spatula here and there and then gently press to spread). Sprinkle remaining crust mixture over the cheese. Bake for 50 minutes. The cake will be fluffy once finished baking and then will flatten once cooled and set (that’s the way farmer’s cheese works). Cool, cut into squares and serve. This cake tastes like cheesecake once cooled in refrigerator. Good for 3-4 days in refrigerator. I love your website! Love your recipes. You are my favorite cook. I made this cake yesterday and it was fabulous. You can definitely taste the farmer’s cheese. It did remind me of cheesecake. So delicious! Leslie, it’s nice to hear that someone else loves farmer’s cheese as much as I do 🙂 It does remind me of a cheesecake as well..all that delicious goodness! Hi I have a question… Do the blueberries have to be dried? Can they be fresh or frozen? Hi Natalie, I have always done it with dried, but I think fresh or frozen would work great as well, just don’t stir for long so the berries don’t juice out much. Thanks Olesya for such a great feedback. I hope the new web design will be more user friendly!